NATA 2019: The NATA is Acronym to National Aptitude Test in Architecture given to students for admission in architectural programs. The exam is conducted by Council of Architecture for facilitating admissions in the 5-year degree programs to all. 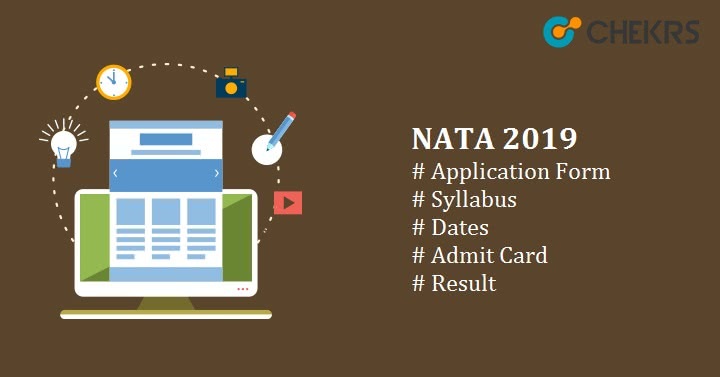 Latest Update: NATA 2019 Admit Card for April session has been released on 1st April 2019. Latest Update: NATA 2019 Application Form has been released from 24th January 2019. Check the Procedure and Fill the Application Form. Latest Update: NATA 2019 FAQs has been released. FAQs Below. Latest Update: CoA has decided to conduct the NATA 2019 test twice a year. Check all changes below. However, NATA Admission 2019 is merely a standard exam to provide all students with a generalized approval. Admission to the program in any of the university/ institution is not assured through it. For NATA Admission Colleges accepting its score, the validity is only for a year. By reading the information available here in the article below you can easily learn events from the notification such as NATA Dates for the application form, admit card, examination, result, counseling along with eligibility criteria and other essential details. The NATA Exam will be conducted two times in a year i.e. April and July Session. Exam Time is divided into 2 60 minutes for aptitude section and 120 minutes for drawing section. A National level centralized counseling is expected to be introducing this year. From this Year Arts stream candidates will be also eligible for NATA 2019, if and only if they qualify the mathematics, physics and chemistry as additional exams conducted by the CBSE board. The NATA Exam 2019 will be conducted on one date as an online examination across different centers of the country. Thus knowledge of dates for pre and post examination is necessary. To ensure that you are equipped and updated with the NATA Important Dates, check out the information provided in the table below. Age: There is no maximum limit for candidates to appear in the exam. Minimum Marks: Though there is no minimum marks compulsion for appearing in the exam, admission in ay B.Arch course is granted only when the aggregate of minimum 50% is scored. Those who possess the interest in the field and looking forward giving the exam will have to initiate the process by filling NATA Online Application Form. The complete NATA Application procedure consists of two stages categorized in Registration Process and Submission of the Application form, and the whole process is online only. Here we will be updating a link through which application form can be submitted. Also, read the steps so that one can learn the complete process of NATA Online Registration and how to apply for the exam. Visit the NATA portal and click on registration for the home page. The page will be redirected to login page. Sign up in the website using your valid credentials in each box. Once done, create your login details at the website. Save them for future use. Login to the website (ignore if already logged in) and click on the apply button from the home page. Online form will appears, fill details in all the mandatory fields and click on the preview to re-check. Once assured, click on submit button and proceed to payment. On successful submission your application process is complete. As NATA is among prominent exams, familiarizing with the exam pattern is essential for all participants of the exam. Reviewing exam pattern helps in obtaining cues for the exam and learns what approach should be used as per self-efficiency. Here we are providing you NATA Paper Pattern so that you can easily learn the essentials of the exam. The drawing test will be offline exam however result of both will be declared together. The drawing test will analyze the capability of individual ability to sketch a given object proportionately and rendering it in an appealing manner. The NATA Syllabus Pdf will be provided first by us and through it you can easily keep a track on your studies. For the Mathematics and general Aptitude, major topics are already provided in the table, whilst the detailed will be available separately. International architects and famous architectural creations, Mathematical reasoning, and Sets and Relations, Analytical reasoning, mental ability (visual, numerical and verbal) and Visualizing different sides of 3D objects. Study from the best author books so that it is easy to learn the basics. Keep practicing drawing as well to improve the skills as they have equally important marks. Skip following refreshers specially designed for NATA as they don’t deliver information on basics. The candidates need to know that both the online and offline exam will be conducted on the same date and at the same venue. The students will have to pay attention to the availability dates of NATA Hall Ticket. The NATA Admit Card is expected to be released in the first week of April. The exact date can be received by seekers first, through the subscription of the page. Also, you will be given the direct link to NATA Admit Card Download. Note: Participants will also have to take any of their photo ID proof along with admit cards. After completion of the exam, participants can expect to check their results within a week of exam date. The result will be uploaded online and describing PART A individual marks but not for Part B. The NATA Result is expected to be released in June first Week. The result will elaborate marks obtained out of total 200 and Pass/Fail information. Through the updates provided timely by us, the NATA Result Date and download can be processed easily. After successfully passing the exam, the NATA doesn’t entitle any admission. Each student will have to apply for each institution separately. It is likely, a few institutions might conduct their individual exam as well and it will be mandatory for students to appear in them.